Members of Congress Tom Suozzi, Kathleen Rice and Peter King announced the Student Planning Committee for the March for Our Lives Rally on March 24 that is being jointly hosted by the three members of Congress in a show of unity and bipartisanship to demand action on common sense gun legislation. 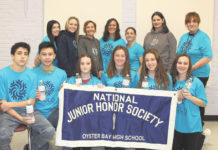 “We are inspired by the teenagers and high school students who are standing up collectively and demanding ‘not one more’ and we want to help them organize across Long Island and beyond. This is a young people’s movement and it’s our job as elected officials to shepherd this passion so meaningful action is taken at the congressional level to address gun violence prevention,” said Suozzi. 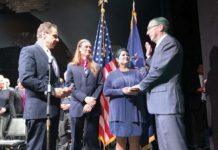 “I am proud of our young people who inspire me and Congressman Suozzi and they give me a renewed sense of effort to continue to advocate for policies that prevent gun violence and keep our communities and children safe,” said King. 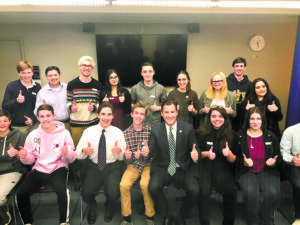 Twenty-two high school students from schools in Baldwin and Lindenhurst to Hicksville and Syosset, as well as the Schechter School and several schools on the North Shore of Nassau, met with Suozzi on Friday, March 9, to discuss how they will get the word out about the rally to their peers, as well as decide the program and speakers for the rally. “I am excited by the energy of these young people and will encourage them as they highlight the need for common sense gun reforms,” said Rice. The students, many meeting each other for the first time, decided to establish regular communications and to meet again on Friday, March 16. The March for Our Lives Rally will be held on Saturday, March 24, at 11 a.m. at the Nold Athletic Complex at Farmingdale State College, 2350 Broadhollow Rd., in Farmingdale. Suozzi, Rice and King support H.R. 4240, the Public Safety and Second Amendment Rights Protection Act, which is being led by Congressman King and cosponsored by Congressman Suozzi. This bill would expand the existing background check system to include all commercials firearm sales, provide reasonable exceptions for family and friends, and preserve Second Amendment Rights. 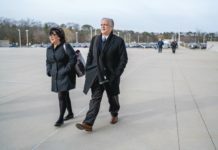 It would also offer states better federal funding if they maintain proper record-sharing systems that help report criminals and the dangerously mentally ill.